2016 was an incredible year for QEMS and, looking back, we have a lot to be thankful for. As we approach the holiday season (and even more exciting news with our company’s 15th Anniversary right around the corner), Executive Management and the Corporate Event Team wanted to take an opportunity to look back with the whole team and show how thankful we are for all the wonderful things that transpired in 2016. The event was catered by Creative Food Solutions and coordinated by Executive Management, Human Resources, and the Administrative Event Team. QEMS was recognized (again) as a safe workplace. Early in the year, we received our second consecutive gold annual safety award from the North Carolina Department of Labor. Executive Management decided to pursue our transition from the ISO9001 standard to AS9100 (Aerospace) by 2017. Action has already been taken internally to begin our transition, with an estimated certification date by summer 2017. This will include a training of an implementation team and a new wave of internal auditors. Considering Monroe, NC (where QEMS, Inc. is located) is home to one of the largest aerospace clusters in the Carolinas (and the Carolinas are a hotbed for American aerospace manufacturing), pursuing this standard shall mark our next launch forward in QEMS’s bright, shining future. QEMS gained six certified Lean Six Sigma Green Belts. Thanks to our Green Belts (Hannah Pham, Sarah Miles, Nirmal Boriwala, Phillip Nguyen, Kien Truong, Mustafa Albayati), we have reduced excess inventory for a high run assembly, increased first time yields in wave solder, and are continuing to reduce changeover time for the SMT lines. We’ll see many more projects in the future from these teams in the future. QEMS partnered with NC State and South Piedmont Community College to invest in further training for some of our current and future leaders. This education has helped improve internal workplace communication. Lean Awareness was also managed earlier in the year, giving the basic Lean concepts to everyone at QEMS. 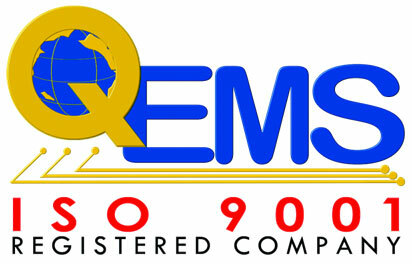 QEMS invested in multiple new equipments and technologies to tighten control on our processes. A CRM and task-master software was launched for the key team in the early part of the year. An SQL-based MRP system update was successfully launched in late August. A modified control plan format (complete with thorough FMEA) was launched in September. A new SMT reflow oven was installed in early November. New barcode scanner software is presently being quoted to minimize manual data entry and improve communication between our internally-designed control plans, the MRP system, and tighter control on serialization. QEMS will celebrate its 15th Anniversary. Technically, the anniversary will take place in early 2017, but our company Christmas party (located at the Ballantyne Hotel on December 17, 2016) will share a celebration for this pivotal landmark. There’s multiple ways to contact us. Did you need to upload us your design? If so please use the form below.